Deriving from the Latin word for "thorn," spina, as a result of its characteristic octahedral crystals having "pointed" ends, spinel commands a unique place in gemstone history. Its close association with royalty is a result of its possession of an appearance that is extremely similar to that of ruby. Spinel's gemological or mineralogical identity was confused with ruby until relatively recently. The stage for confusion was probably set due to the fact that modern gemology was a latecomer to the science field. The gem experts of yesteryear were frequently unable to distinguish between these two similar looking gem-minerals found in the same locales - their differences were missed by the brightest minds of those times and were not finally distinguished until the 19th Century. Spinels of all colors have been found in various different locations worldwide. The market of today sees reds, pinks, oranges and pale blues, and a few other "fancy colors." 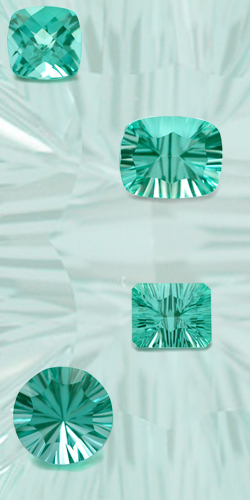 Lab Created Green Spinel Gems are available at Andegem.com on a per order basis only. To inquire about pricing, shipping rates or any other information you need about Lab Created Green Spinel please email us at sales@andegem.com .